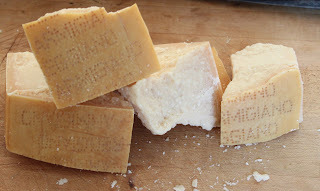 In one of last week’s supermarket flyers one item caught my attention: Real Parmigiano Regiano on sale at less then half price! Wow, got to have that, and lots of it! 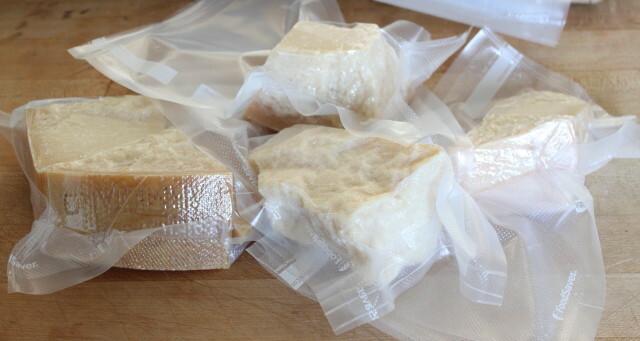 Vacuum packed and ready for fridge. 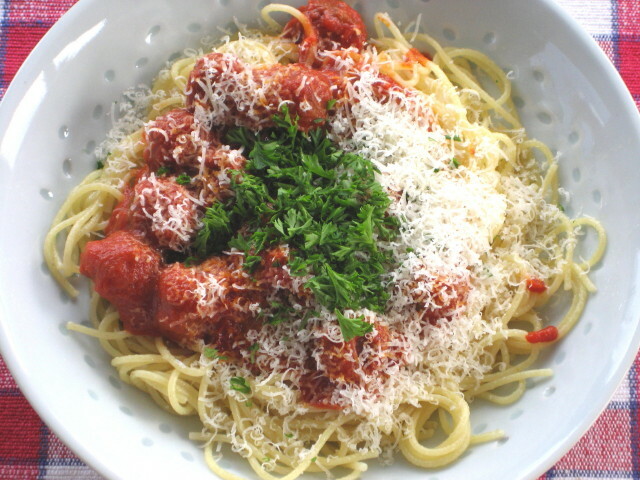 Choice of the supper for that day had to have a Parmigiano in it, of course and since while back I made a big batch of spicy meatballs and tomato sauce and vacuum packed them, the meal was a breeze to prepare. In the morning I started to crave for mashed potatoes. Not your regular, boring job but mashed root vegetables. I used Gold Yukon and Russet potatoes (baking and mashing potato variety), Sweet Potato and Celeriac. After mashing I added, as I always do, green peas. Served together with caramelized Vidalia onions and juicy pork chops made a really satisfying comfort food to match the lousy weather outside. Russet Potato, Yukon Potato, Sweet Potato and Celeriac. In the morning it looked like we are going to have a nice grilling weather but as the dinner hour approached it turned cold and windy. The steak I wanted to grill had to be cooked inside. It turned out better then I expected! Tender and juicy and I served the steak on a bed of Napa cabbage and with fresh shitake, steamed asparagus, fresh tomatoes and roasted potatoes. Very, very nice indeed! 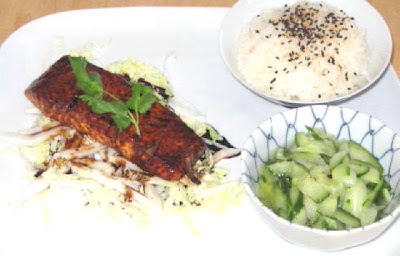 Nice sunny day outside called for a light meal and since we didn’t have cooked salmon for a while I have decided on a good standby of Salmon Teriyaki with rice and cucumber salad. 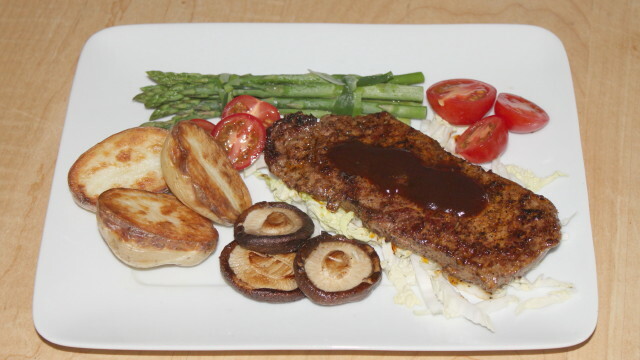 Foolproof and no fuss meal if you have teriyaki sauce on hand as I always do. We can have this meal every week and in summer we do, I think. Grilling Season is at the door and I can’t wait. Last week I bought frozen sardines and I want to grill them first chance I get. The whole fish gets grilled with just a salt and pepper, squeezed lemon and fresh Italian bread or baguette with some greens on side and we will have a feast! We love to eat in our sunroom and to see our garden. Soon, the flower beds will be full of flowers, starting with tulips and daffodils. Pan Fried Salmon, Green Beans and Red Pepper.